Hello and welcome once again to this month’s free flatpicking lesson portion of our monthly newsletter. First, I’d like to thank all the folks who click on this portion of the newsletter each month. I appreciate all the positive reader feedback. I really enjoy doing these lessons and I do, in fact, keep everyone in mind when I arrange these tabs. I try to eliminate many of the ornamentations that crowd up many fiddle tune tabs, hence making them difficult to master. My goals with these lessons are to present melodic versions of tunes that adhere to tradition, build diverse repertoire, and that can actually be mastered! Once you have a good grasp on a tune’s melody, you will have much more success incorporating hammer-ons, pull-offs, and hot licks into your playing. For this month’s lesson I have chosen “Cattle In the Cane,” an old fiddle tune made famous by Tony Rice on his album Church Street Blues. I feel that Tony’s recording introduced lots of folks, particularly guitar players, to this tune. His interpretation of the melody has become a standard from which others use to explore the tune. I am a huge fan of Tony Rice, but I find it equally intriguing to listen to a good old-time fiddle player jam on “Cattle In the Cane.” I’m sure Tony himself would agree that listing to the source (i.e. 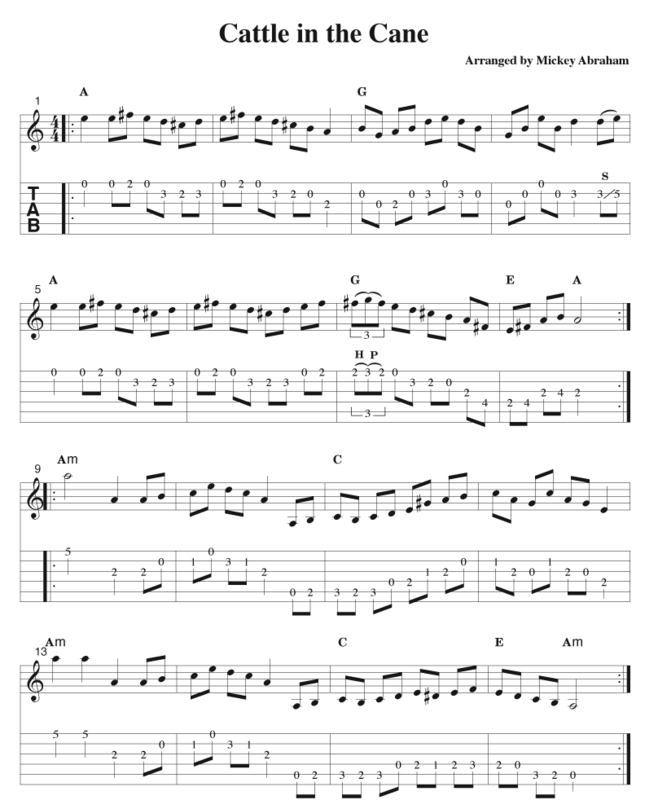 fiddle players) is a great way to learn the actual melody of a fiddle tune. It continues to amaze me how many ways there are to play a given fiddle tune! What makes “Cattle In the Cane” most unique is that the A section has an A major/bluesy feel while the B section switches gears to an A minor vibe. Every time the tune goes from the A section to the B section there is a complete mood change that makes the tune interesting to hear and really fun to play! In music theory, the A section is played out of the A mixolydian scale (R, 2, 3, 4, 5, 6, b7, R). It is simply an A major scale with a flatted 7th. This is way it has a major quality, but still retains a bluesy sound. The mixolydian scale was a favorite of Bill Monroe for this reason. Songs like Big Mon, Red Haired Boy, and Salt Creek are examples of melodies that are based on this major/bluesy mixolydian scale. The B section is a mixture of two scales, A natural minor (R, 2, b3, 4, 5, b6, b7, R) and A harmonic minor (R, 2, b3, 4, 5, b6, 7, R). These two scales only differ in one note and both are helping create a more authentic minor sound which is expressed mostly in the b3rd. In the B section, The bluesy feel is gone and we have entered a more European sound. Jerusalem Ridge is an example of a tune in the key of A harmonic minor. If you enjoy trying to improvise and solo over chord changes, “Cattle in the Cane” will keep your brain busy and your ears excited trying to switch between these two different tonalities. I hope you enjoy adding “Cattle In the Cane” to your list of tunes. I know you will find this arrangement most enjoyable to work through. If you have any questions or comments on this e-lesson or any ideas you’d like to see here in the future, just drop me a line at michabraham@comcast.net .